For other uses, see Ghosthunters (disambiguation). "Paranormal investigation" and "paranormal investigator" redirect here. For other uses, see paranormal. "Ghost hunt" redirects here. For the light novel series and its adaptations, see Ghost Hunt. A ghost hunter taking a reading with an EMF meter. Ghost hunting is a pseudoscience wherein adherents visit and investigate locations that are reported to be haunted by ghosts. Typically, a ghost hunting team will attempt to collect evidence that they see as supportive of paranormal activity. 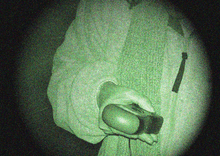 Ghost hunters often use a variety of electronic devices: the EMF meter; digital thermometer; handheld and static digital video cameras, such as thermographic (or infrared) and night vision; digital audio recorder; and computer. Traditional techniques such as conducting interviews and researching the history of a site are also employed. Some ghost hunters refer to themselves as a paranormal investigator. Ghost hunting has been criticized for its absence of scientific method; no scientific body has been able to confirm the existence of ghosts. Ghost hunting is considered a pseudoscience by a majority of educators, academics, science writers, and sceptics. In contrast, the concept of the ghost and narratives featuring ghosts are a topic of academic study in folkloristics. The Internet, films (like Ghostbusters) and television programs (like Most Haunted, Ghost Hunters, The Othersiders and Ghost Adventures), along with the increasing availability of high-tech equipment, are thought to be partly responsible for the boom in ghost hunting. Despite its lack of acceptance in academic circles, the popularity of ghost-hunting reality TV shows has influenced a number of individuals to take up the pursuit. Small businesses offering ghost-hunting equipment and paranormal investigation services have increased in the last decade. Many offer electromagnetic field (EMF) meters, infrared motion sensors and devices billed as "ghost detectors". The paranormal boom is such that some small ghost-hunting related businesses are enjoying increased profits through podcast and web site advertising, books, DVDs, videos and other commercial enterprises. One ghost-hunting group reports that the number of people taking its tours has tripled, jumping from about 600 in 2006 to 1,800 in 2008. Another says its membership has doubled. Others point to increased traffic on their websites and message boards as an indication that ghost hunting is becoming more accepted. Participants say that ghost hunting allows them to enjoy the friendship of like-minded people and actively pursue their interest in the paranormal. James Willis, founder of The Ghosts of Ohio group, says that his membership has grown to 30 members since it was founded in 1999 and includes both true believers and total skeptics. Willis says his group is "looking for answers, one way or another" and that skepticism is a prerequisite for those who desire to be "taken seriously in this field." Author John Potts says that the present day pursuit of "amateur ghost hunting" can be traced back to the Spiritualist era and early organizations founded to investigate paranormal phenomena, like London's The Ghost Club and the Society for Psychical Research, but that it is unrelated to academic parapsychology. Potts writes that modern ghost hunting groups ignore the scientific method and instead follow a form of "techno-mysticism". The popularity of ghost hunting has led to some injuries. Unaware that a "spooky home" in Worthington, Ohio was occupied, a group of teenagers stepped on the edge of the property to explore. The homeowner fired on the teenagers' automobile as they were leaving, seriously injuring one. A woman hunting for ghosts was killed in a fall from a University of Toronto building. An offshoot of ghost hunting is the commercial ghost tour conducted by a local guide or tour operator who is often a member of a local ghost-hunting or paranormal investigation group. Since both the tour operators and owners of the reportedly haunted properties share profits of such enterprises (admissions typically range between $50 and $100 per person), some believe the claims of hauntings are exaggerated or fabricated in order to increase attendance. The city of Savannah, Georgia is said to be the American city with the most ghost tours, having more than 31 as of 2003. According to a survey conducted in October 2008 by the Associated Press and Ipsos, 34 percent of Americans say they believe in the existence of ghosts. Moreover, a Gallup poll conducted on June 6–8, 2005 showed that one-third (32%) of Americans believe that ghosts exist, with belief declining with age. Having surveyed three countries (the United States, Canada, and Great Britain), the poll also mentioned that more people believe in haunted houses than any of the other paranormal items tested, with 37% of Americans, 28% of Canadians, and 40% of Britons believing. In 2002, the National Science Foundation identified haunted houses, ghosts, and communication with the dead among pseudoscientific beliefs. Although some ghost hunters believe orbs are of supernatural origin, skeptic Brian Dunning says that they are usually particles of dust that are reflected by light when a picture is taken, sometimes it may be bugs or water droplets. He contends that "there are no plausible hypotheses that describe the mechanism by which a person who dies will become a hovering ball of light that appears on film but is invisible to the eye." He does not believe there is any science behind these beliefs; if there were then there would be some kind of discussion of who, what and why this can happen. In his investigations he can not find any "plausible hypothesis" that orbs are anything paranormal. Science writer Sharon Hill reviewed over 1,000 "amateur research and investigation groups" (ARIGs), writing that "879 identified with the category of “ghosts”. Hill reports that many groups used the terms “science” or “scientific” when describing themselves; however "they overwhelmingly display neither understanding of nor adherence to scientific norms". "ARIGs often promote their paranormalist viewpoint as scientifically based, especially in community presentations or lectures at educational facilities. While scientifically minded observers can readily spot the anemic and shoddy scholarship of popular paranormal investigation, the public, unaware of the fundamental errors ARIGs make, can be persuaded by jargon and “sciencey” symbols." Hill sees the supernatural bias of such groups as an indication of how "far removed ARIG participants really are from the established scientific community". Ghost hunters use a variety of techniques and tools to investigate alleged paranormal activity. While there is no universal acceptance among ghost hunters of the following methodologies, a number of these are commonly used by ghost hunting groups. Still photography and video: using digital, night vision, infrared, and even disposable cameras. EMF meter: to detect possibly unexplained fluctuations in electromagnetic fields. Tablet PC: to record data, audio, video and even environmental fluctuations such as electromagnetic fields. 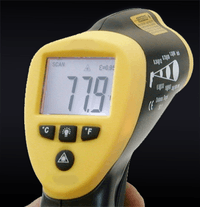 Ambient temperature measurement: using thermographic cameras, thermal imaging cameras, infrared thermometers, and other infrared temperature sensors. It should be noted that all of these methods only measure surface temperature and not ambient temperature. Digital and analog audio recording: to capture any unexplained noises and electronic voice phenomena (EVPs), that may be interpreted as disembodied voices. Compass: some ghost hunters use a compass to determine the location of paranormal spots, similar to EMFs. Geiger counter: to measure fluctuations in radiation. Infrared and/or ultrasonic motion sensors: to detect possible anomalous movement within a given area, or to assist in creating a controlled environment where any human movement is detected. Air quality monitoring equipment: to assess the levels of gases such as carbon monoxide, which are thought to contribute to reports of paranormal activity. Infrasound monitoring equipment: to assess the level of sound vibrations. Dowsing rods: usually constructed of brass and bent into an L-shape. Psychics, mediums, or clairvoyants: trance mediums or "sensitive" individuals thought to have the ability to identify and make contact with spiritual entities. Demonologists, exorcists, and clergy: individuals who may say prayers, give blessings, or perform rituals for the purpose of cleansing a location of alleged ghosts, demons, poltergeists, or "negative energy". Lights out: according to ghost hunting enthusiast websites, many ghost hunters prefer to conduct their investigations during "peak" evening hours (midnight to 4 a.m.). Ghost Box: an electronic device that some ghost hunters claim allows communication with spirits. Interviews: collecting testimony and accounts about alleged hauntings. Historical research: researching the history behind the site being investigated. A Ouija board to communicate with spirits. According to ghost hunters, a cold spot is an area of localized coldness or a sudden decrease in ambient temperature. Many ghost hunters use digital thermometers or heat sensing devices to measure such temperature changes. Believers claim that cold spots are an indicator of paranormal or spirit activity in the area; however there are many natural explanations for rapid temperature variations within structures, and there is no scientifically confirmed evidence that spirit entities exist or can affect air temperatures. ↑ Cohen, Howard (September 19, 2009). "Ghost hunters say Deering Estate is ground zero for lost spirits". The Miami Herald. Archived from the original on October 10, 2010. Retrieved 8 January 2010. ↑ Radford, Benjamin (27 October 2006). "The Shady Science of Ghost Hunting". LiveScience. Retrieved 15 December 2009. ↑ "Study: No Scientific Basis for Vampires, Ghosts". Fox News. Washington: Associated Press. October 26, 2006. 1 2 "Relationships Between Science and Pseudoscience". Science and Engineering Indicators, 2002. National Science Foundation. Retrieved 12 September 2015. ↑ Dr Olu Jenzen; Professor Sally R Munt (28 January 2014). The Ashgate Research Companion to Paranormal Cultures. Ashgate Publishing, Ltd. pp. 197–. ISBN 978-1-4724-0612-5. 1 2 Hill, Sharon. "Amateur Paranormal Research and Investigation Groups Doing 'Sciencey' Things". Csicop.org. Skeptical Inquirer — Volume 36.2 March/April 2012. Retrieved 26 February 2015. 1 2 Radford, Benjamin. "Ghost-hunting mistakes: science and pseudoscience in ghost investigations". Skeptical Inquirer. Committee for Skeptical Inquiry. Retrieved 12 September 2015. ↑ Schmaltz, Rodney. "Battling Psychics and Ghosts: The Need for Scientific Skepticism". Huffington Post. Huffington Post. Retrieved 12 September 2015. ↑ Campbell, Hank. "Think Pseudoscience Isn't Dangerous? Ghost Hunter Looking For Ghost Train Killed By Real One". Science 2.0. ION Publications. Retrieved 12 September 2015. 1 2 Potts, John; James Houran (2004). Ghost Hunting In The Twenty-First Century (From Shaman to scientist: essays on humanity's search for spirits). Scarecrow Press. Retrieved 15 December 2009. 1 2 3 4 Peterson, Skip; Associated Press (2008-05-31). "Ghost-hunting groups enjoy surge in popularity". USA Today. Retrieved 14 December 2009. ↑ Smyth, Julie C (2007-08-21). "'Spooky House' case splits Ohio suburb". USA Today. Retrieved 2008-08-24. ↑ "Ghost-hunting woman dies at U of Toronto". United Press International. September 10, 2009. Retrieved 15 December 2009. ↑ Howard, Philip (December 18, 2006). "Confessions of a Ghost Tour Guide and Skeptic". The Committee for Skeptical Inquiry. Retrieved 15 December 2009. ↑ "Walk your scaredy-pants off in Savannah". CNN.com Travel. CNN. 2003-10-30. Retrieved 2010-05-03. ↑ "Rantoul grad's film explores 'America's Most Haunted City'". News-Gazette. ↑ Lyons, Linda (July 12, 2005). "One-Third of Americans Believe Dearly May Not Have Departed". Gallup Poll. Gallup. Retrieved 14 February 2010. 1 2 Moore, David W. (June 16, 2005). "Three in Four Americans Believe in Paranormal". Gallup Poll. Princeton, NJ: Gallup. Retrieved 14 February 2010. ↑ Lyons, Linda (November 1, 2005). "Paranormal Beliefs Come (Super)Naturally to Some". Gallup Poll. Gallup. Retrieved 14 February 2010. ↑ Ettkin, Brian (October 27, 2008). "Skeptic: Ghost hunters practice 'pseudoscience'". Albany Times-Union. Archived from the original on October 10, 2010. Retrieved 14 December 2009. ↑ Brian Dunning (2007-02-27). "Orbs: The Ghost in the Camera: Are orbs really ghosts, or a common artifact of photography?". Skeptoid: Critical Analysis of Pop Phenomena. Retrieved 2011-11-10. ↑ Tung, Christen (September 7, 2016). ""Ghost Hunting Equipment: Tools To Get Rid Of Demons by Amy Bruni"". Maggwire. ↑ "Ghosts Hunting Equipment Checklist". 1 2 Kirby, Carrie (October 31, 2005). "Ghost hunters utilize latest in technology". San Francisco Chronicle. San Francisco. ↑ "IR Thermography Primer Answers to the Common Questions People Ask about IR Thermography". ITC Infrared Training Center. 2010-08-21. Retrieved 2011-03-06. ↑ Brian Regal (15 October 2009). Pseudoscience: A Critical Encyclopedia: A Critical Encyclopedia. ABC-CLIO. pp. 43–. ISBN 978-0-313-35508-0. ↑ Nickell, Joe (September–October 2006). "Investigative Files - Ghost Hunters". Skeptical Inquirer. 30.5. Retrieved 7 June 2016. "Ghost Hunting Tools of the Trade". Skeptoid. "Ghost Hunting Science Vs Pseudoscience". Stephen Novella.